The rib section consist of ribs 6 through 12. 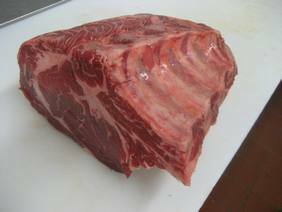 The large end, ribs 6-9 is a little more fattier than the smaller end ribs 9-12 which contain the large rib eye muscle. The naturally tender, rich flavor prime rib is known as the king of roast. Many consider the rib a special occasion roast, only cooking it once or twice a year. Prime rib roast can be cooked at different temperatures with different results. We discuss two ways that yield good results. The first way is our favorite, there is a little more work involved and it takes a little longer but its worth it. Many of the finest restaurants that serve prime rib roast use low temperatures to achieve those great juicy beefy flavors. In our experience cooking rib roast at higher temperatures of the 350-450 degree range will cause a roast to dry out on the outer parts and shrink anywhere form 3/4 to 1lb or more depending on the size of the roast by the time its done cooking. A low temperature of 250 degrees will cook the meat evenly through from the center to the outer edge without any drying out, leaving the meat tender and juicy. You might be concerned about the possibility of bacteria and it has been shown that this way of cooking is actually safe but to have piece of mind there is a way to solve this and at the same time give the roast a nice brown surface. 1. An hour before cooking, remove the prime rib roast from the refrigerator to bring to room temperature. Once the pan is hot sear the roast on all sides for 1.5 - 2 minutes per side excluding the bones side. A large heavy skillet can also be used to sear the roast. 4. Cooking prime rib to a temperature of 135-140 degrees (medium-rare) for maximum flavor and tenderness will give you a tender juicy roast or 140-150 degrees (medium) but no more, anything more will begin to dry out the roast. Depending on the size of the roast, cooking times for roast beef will take 25-30 minutes per pound, so you must have an instant-read thermometer to make sure you don't overcook. Remove roast from oven and tent with foil. Let it rest at least 15- 20 minutes to allow the juices to redistribute themselves evenly throughout the roast. When cooking at 250 degrees the roast will only rise another 2 degrees or so during the resting time. Cut crosswise into 1/3-inch-thick slices. Arrange slices on platter and serve. Below is a cooking chart for beef roast. Remember you should always use an instant-read thermometer to check the doneness of a roast. In method A because a temperature of 250 degrees is used the temperature will only rise about 2-4 degrees during resting time. The second method is a non-risky way to cook a prime rib roast, it will give you a tender, juicy roast that won’t embarrass you. 3. Reduce oven temperature to 325°F and a roast cooking time about 15-18 minutes per pound is a guideline. Cook rib until instant-read thermometer inserted into thickest part of meat registers 135-140°F (medium-rare), which will give you maximum flavor and tenderness or 140-150°F (medium) but no more, anything more will begin to dry out the roast. The internal temperature will rise about 5-10 degrees during resting time. Remove the rib roast 5-10 degrees before the desired doneness. Remember you should always use an instant-read thermometer to check the doneness of a roast.